The science and industry are constantly developing. Electronic devices become more and more complicated, yet, smaller and smaller. 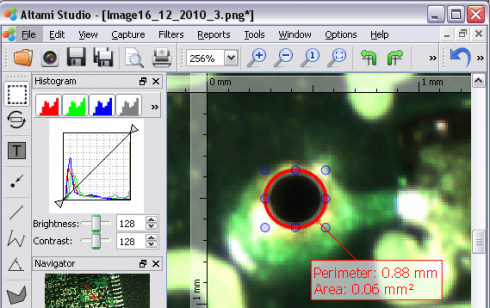 It is impossible to imagine modern science and technology without live image analysis, and the electronics industry actively uses image measuring and processing applications for quality control and making precise measurements as well. Altami Studio application can be used for many purposes but now we shall concentrate on the printed board measuring and control. Altami Studio application provides numerous other possibilities to process images, among them вЂ” to make a panorama image out of several images in live mode. You can download Altami Studio application at the download page. You can buy Altami Studio application following the instructions at the purchase page.